The Miraflores and Picachos Regional Natural Park has become the first regional protected area in the Amazon as a result of joint work between Corpoamazonia, WWF, the governorship of the department of Caquetá, municipal governments, and local communities. This declaration contributes to the protection of 71% of Caquetá’s high Andean forests, 10.1% of its sub-Andean highlands, and 12.4% of its highlands. By means of this contribution, 94% of highland ecosystems in the region are now protected. This declaration further increases WWF’s contribution to the establishment and expansion of protected areas in strategic ecosystems in Colombia. WWF accompanied the entire process, including aspects related to the declaration route, social dialogue, and technical inputs needed to consolidate this achievement. December 20, 2018 – Starting today, the Colombian Amazon has a new protected area under the Regional Natural Park category. The area is located in the north of the department of Caquetá, in the region of the Amazon basin where the Caguán Alto, Guayas, and Orteguaza rivers are formed. Its landscape is characterized by the presence of highland ecosystems and high Andean and sub-Andean forests, which are important for the provision of several ecosystem services. 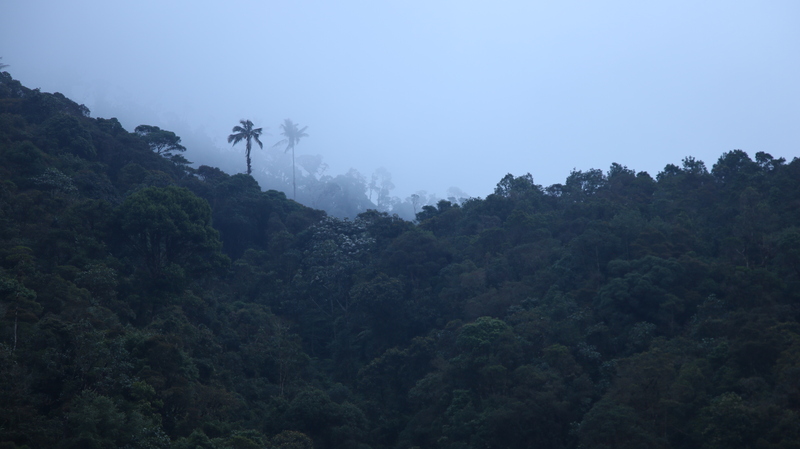 The highlands of Miraflores and Picachos, and a large part of the surrounding forests, contribute to the wellbeing of the inhabitants of the mid-level and low-lying zones of the Amazon. That is why Corpoamazonia, as the region’s environmental authority, identified common objectives with the area’s neighboring communities and signed agreements to favor the area’s conservation and adequate management. This new protected area, which includes 106,554 hectares in the department of Caquetá, is the 55th to fall under the Regional Natural Park category and the first protected area declared by CORPOAMAZONIA in its 25 years of existence. Additionally, it is the largest area declared under this category by a regional environmental authority. Why conserve Miraflores and Picachos? “Conserving the highlands and forests of Caquetá’s Andean-Amazonian foothills allows for the protection of nearly 100,000 hectares of forest in a region with high levels of biodiversity, and it ensures water provision for the region’s inhabitants and helps regulate the global climate,” says Carlos Mauricio Herrera, protected areas planning specialist at WWF-Colombia. For neighboring communities, this declaration is an opportunity to solve historical problems related to territorial planning, including land tenure and use. However, for the region’s conservation to be sustainable, it is important that people neighboring the Regional Natural Park become allies in the area’s management. The declaration of this Regional Natural Park reduces pressure on the territory, including the advancement of the agricultural frontier and the existing road between Algeciras and the district of Santana Ramos in the municipality of Puerto Rico, which eases access to natural resources extraction and potential settlements, among others. 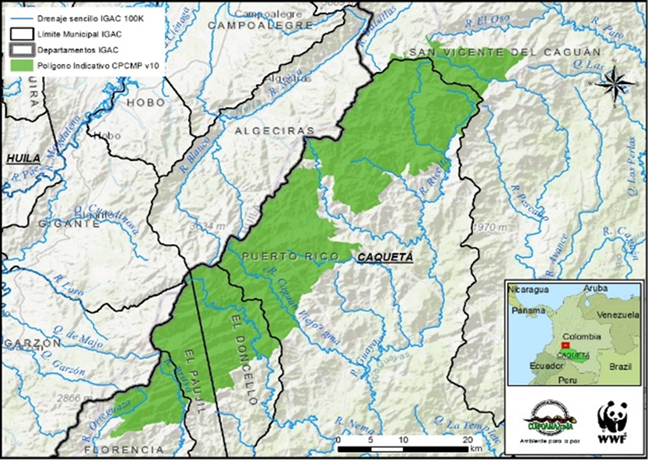 The map shows the location of the Miraflores and Picachos Regional Natural Park in the department of Caquetá. El Parque Regional Miraflores y Picachos es la primera área protegida regional de la Amazonia colombiana.